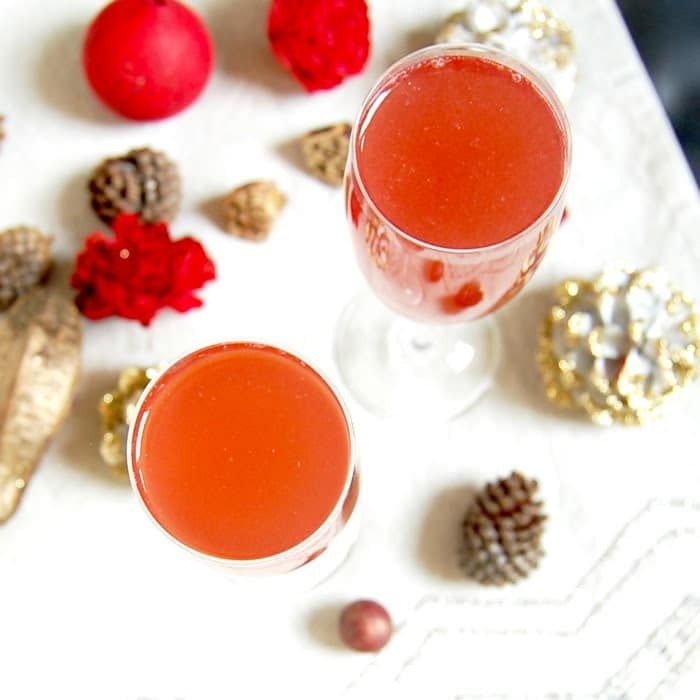 The holiday season is here and if you’re the one hosting holiday parties or a New Year’s Eve soiree, you definitely need a signature cocktail on the menu like this Pomegranate French 75! For the past few years, my husband and I have hosted New Year’s Eve celebrations, coming up with a new cocktail for our guests each year. In the past, we’ve served cranberry cider cocktails (hot or cold, depending on your preference), a sparkling party punch, and orange or grapefruit-based drinks. 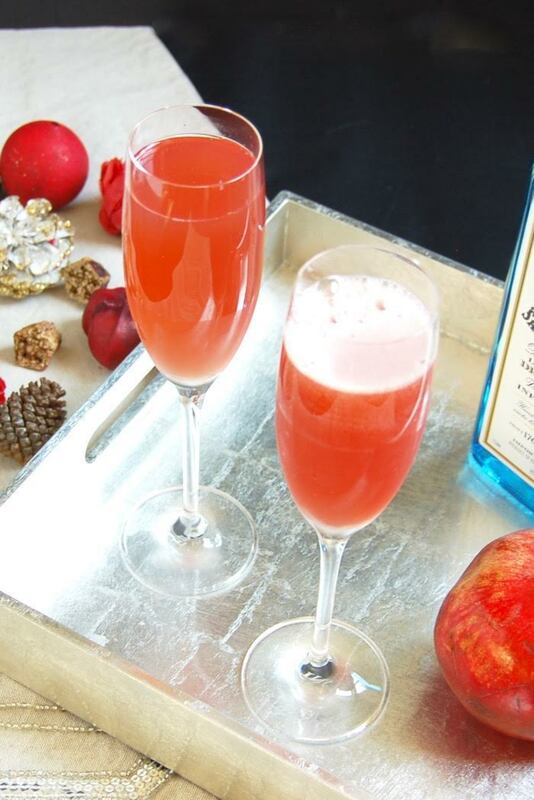 This year, I’ll be serving my guests these gorgeous crimson-colored Pomegranate French 75 cocktails. If you can’t tell, I love using fresh, seasonal produce in my cooking, and the same is true when it comes to beverages. I also can’t get enough of the bright and beautiful pomegranates and cranberries that are available this time of year. Adding them to food and drinks is an easy and festive way to highlight the color of the season at your table. There are many ways to incorporate seasonal fruits in your cocktails, but this twist on the classic French 75 immediately came to mind. That’s because the French 75 is my absolute favorite, go-to drink at a bar or restaurant. Granted it’s not as common as a vodka tonic or an old fashioned, but most bartenders know how to make a classic French 75 and if they have some color-infused simple syrups, that’s an easy way to jazz up this drink. If you’re not familiar, a classic French 75 is a combination of gin, lemon juice, simple syrup, and Champagne or sparkling wine. This is a drink that stimulates most of your senses – it’s tart and herbal in flavor, effervescent and refreshing in taste, and elegant in appearance. 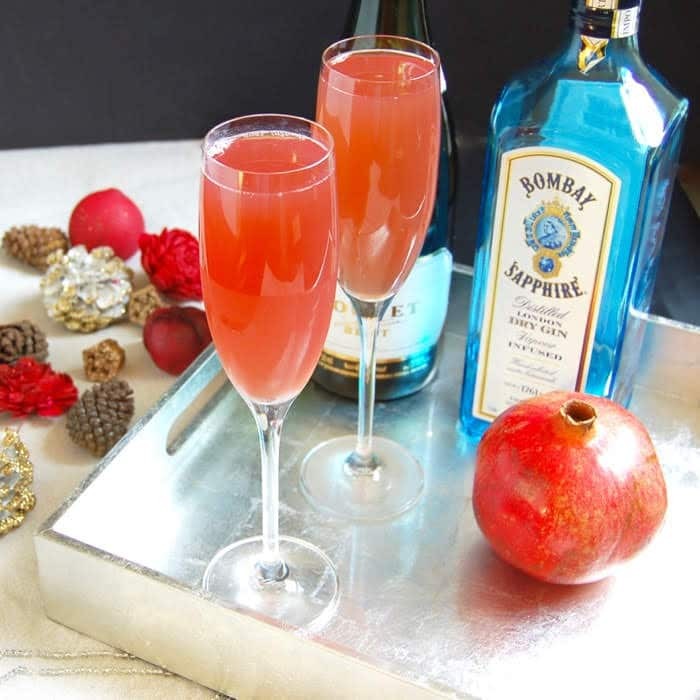 This Pomegranate French 75 is not the only variation of the classic drink that I have made. A few years ago, I added freshly squeezed orange juice to the traditional recipe for an Orange French 75. 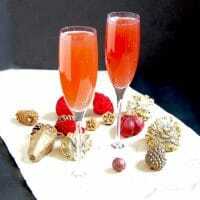 You could easily swap fresh grapefruit juice, another fruit of the season, to make a grapefruit French 75. For this year’s bright and festive cocktail, I went one step beyond just adding fresh juice to the usual recipe. To get a rich pomegranate flavor and deep ruby red color, I made a pomegranate simple syrup. A traditional simple syrup is made by combining equal parts water and sugar and reducing the mixture to the consistency of syrup. Since pomegranate juice is already naturally sweet, I wanted to limit the amount of added sugar in my pomegranate variation. To do this, I used SPLENDA® Naturals Stevia Sweetener, Table Top Jar – a no calorie sweetener sourced from the sweeter, cleaner-tasting part of the stevia leaf. Unlike other stevia products, SPLENDA® Naturals Stevia Sweetener has no bitter aftertaste, so it perfectly mimics regular sugar, but has half the calories! So instead of using 1 cup of sugar per 1 cup of liquid to make simple syrup, I can use 1/2 cup of SPLENDA® Naturals Stevia Sweetener per 1 cup pomegranate juice. That adds up to quite a large savings in calories and added sugar! The key to making the pomegranate syrup for this Pomegranate French 75 is patience and keeping the mixture at a medium simmer – not so low that it’s just sitting there, but not so high that it’s fully boiling and bubbling up. Once the mixture thickly coats the back of a spoon, turn off the heat, transfer the syrup to a glass measuring cup or mason jar and let cool. Ideally you will make the syrup in advance so you can chill it in the refrigerator prior to use. Also note that the recipe for the syrup makes enough for multiple drinks (how many depends on how much you use per drink) and can be stored in the refrigerator for a couple of weeks. Just enough time to get you through all the holidays! Making the Pomegranate French 75 itself is a cinch once the syrup is made. Combine gin, pomegranate simple syrup, lemon juice, and ice in a cocktail shaker. Pour the mixture into your glass of choice – French 75 cocktails are typically served in champagne flutes – and finish off with champagne, prosecco, or your choice of sparkling wine. While this is an adult beverage, there is certainly an easy way to turn it into a mocktail for kids or those who prefer non-alcoholic drinks. Just combine the pomegranate simple syrup with lemon juice and seltzer and you’re done. Don’t feel like tending bar all night? Make the pomegranate/gin/lemon juice mixture in a pitcher with a bottle of sparkling wine on the side. Everyone can make his or her own! In a small saucepan, combine pomegranate juice and SPLENDA® Naturals Stevia Sweetener, Table Top Jar. Bring mixture to a boil; reduce heat to medium-low, and stir continuously until the sweetener dissolves completely. Continue cooking the mixture at a low boil until the mixture has reduced and is syrupy (it should form a thick coat on the back of a spoon). Remove syrup from the heat and let cool to room temperature. Transfer to a measuring cup or resealable glass container. Store in the refrigerator for up to three weeks. Fill a cocktail shaker with ice. Add gin, pomegranate simple syrup, and lemon juice to shaker. Shake vigorously, about 15 to 20 seconds. Strain into a champagne flute and add champagne, prosecco, or sparkling wine. *If you prefer to use regular sugar, use 1 cup sugar per 1 cup water to make the simple syrup. The nutritional facts will change as follows: 170 calories, 5 g sugar per cocktail. Have you ever had a French 75? What will you be drinking to celebrate the holidays? I’m gonna have to make these for our New Year’s party. They look delicious and so festive!! Thanks Rachel! Let me know how they come out! Oh my goodness…DELISH! I love pomegranate and am so making these for guests over the holidays! I will have to wait until next year, as I am pregnant! Yum! Thanks Whitney! You should definitely make a mocktail version for yourself. A whole year is way too long to wait for these beauties! today’s the day of sparkling pomegranate drinks! I’ll have to try this simple syrup, looks delicious! Yes, I love that too. So easy! I love parties that have a special cocktail! Sign me up – I’ll be right over! 🙂 This looks tasty! And pretty too! I’m all about the signature cocktail! Come on over! I’m all about pomegranate drinks this time of year – they’re so festive and fun for the holidays! So glad you like them too! 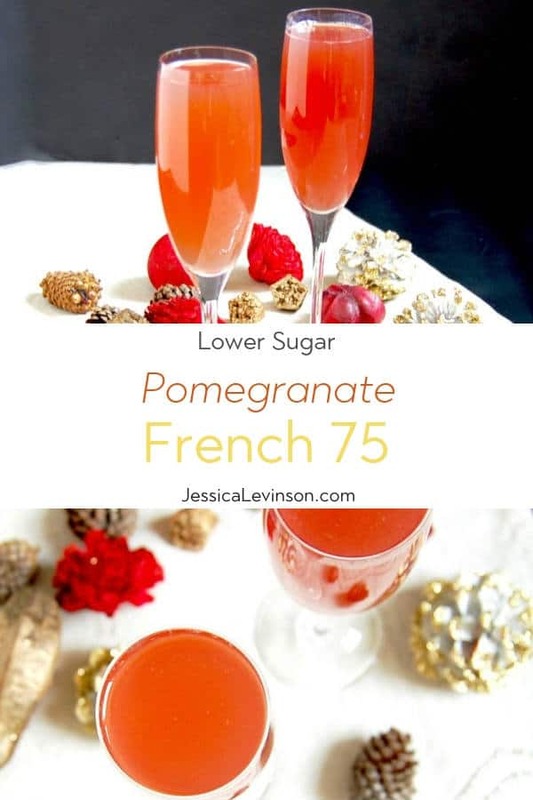 Hope you give this Pomegranate French 75 a try! My husband’s family has always been into gin. I didn’t like it much until I tried Bombay Sapphire – it’s the only one I’ll drink! I don’t often order it when out though, because the mixed drinks are too sugary. I LOVE that you made this sugar-free!! I love Bombay Sapphire (as you can see from my pic!). I hope you’ll give this drink a try. The Splenda Naturals Stevia Sugar Blend still has some added sugar in it, but the drink is definitely lower in sugar than if it were made with a 100% sugar simple syrup! I’ve never had a French 75 but I suddenly need one very much. This one especially! I hadn’t either until a few years ago. I still remember my first one 😉 And as the babies got bigger I found I needed more of them, lol! Hope you give it a try! How delicious! Love the pomegranate in this. Pour me two. Such a beautiful drink and perfect for the holidays! Gorgeous. Definitely saving! Thanks so much Christine! Hope you enjoy one (or two) over the holidays! I was sold at Champagne or Prosecco! This recipe sounds fantastic! Honestly delicious! I will be sure to try this one! Thanks Daniela! Can’t wait to hear how you like it! What a great cocktail to enjoy this season! Pomegranate is one of my favorite flavors in cocktails! Love that it’s made with less sugar too. This sounds so good! I’ve had a regular French 75, but I think pomegranate juice would make it even more delicous! The pomegranate syrup definitely brightens it up – in both color and flavor! Enjoy! I love all cocktails made with pomegranate juice. It’s such a festive way to make them for the holidays. Wouldn’t this be nice by the fire on Christmas Eve? Woohoo! Can’t wait to hear how you like it! Happy holidays. You’ve combined all the BEST things into one cocktail! why thank you! Hope you enjoy. The color of your pomegranate cocktail is so vibrant. I love pomegranate juice in fact I have some almost every second day at home. So your cocktail is right up my alley! This is such a gorgeous cocktail and I love that it’s lower sugar!! I had never heard of it either until a few years ago. Let me know if you enjoy a mocktail version now! It’s such a pretty color. Very festive. Oh wow! This cocktail looks divine! I will for sure be making these for guests + save the recipe for me for next year when I’m not baking a bun in my oven!!! I absolutely love pomegranate in cocktails. What a fun twist here! I do too! Pomegranate margaritas are one of my faves! Love the festive coloring! This looks AMAZING and absolutely perfect for the holiday season :). Thanks so much Christine! Hope you give it a try. Happy holidays! Beautiful cocktail! We just bought a bottle of Bombay Saphire East and it is delicious. Now all I need is the pomegranite juice! Thanks Catherine! And how perfect! I’m not familiar with the Bombay Sapphire East – how is it different from the original? What a festive cocktail! yummy!! Thanks Stacey! I’m pomegranate obsessed these days! This is perfect for me. I love a French 75 but I don’t like sugary cocktails, it’s like the best of both worlds. I am so happy to hear that Ayngelina! Hope you enjoy one this holiday season. This is gorgeous! I can never get enough pomegranate this time of year!